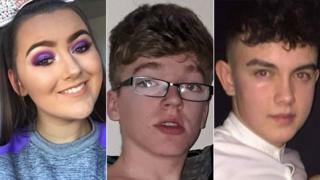 Police investigating the deaths of three teenagers at a St Patrick's Day party crush have said more could easily have been killed. CCTV showed as many as 400 people outside the hotel, the PSNI said. They have tracked down 160 witnesses, and reassured others they will not face questions about being under-age. "I think that we are fortunate, if that is the right word to use," said Det Ch Supt Raymond Murray. "In these circumstances we are looking at three deaths... Bad enough, a horrendous tragedy, but we could easily could be looking at more." A number of young people who witnessed the crush have complained about the response of security staff at the hotel as the emergency unfolded. Eyewitness Eboney Johnston told BBC News NI that the bouncers did not appear to "realise the seriousness of what was going on". She described seeing a toppling effect on the crowd during "pushing and shoving" in the queue. The 16-year-old has been to the Greenvale disco before and claimed that "pushing and shoving would be normal" in the queue. Ms Johnston explained at a previous disco at Christmas, the bouncers kept the queue in a straight line and removed any customers who were pushing and shoving, but she claimed that bouncers did not appear to take the same action on Sunday. BBC News NI put Ms Johnston's claims to the Greenvale Hotel, but its spokeswoman replied that it was "not possible or appropriate" for the hotel to comment "while these matters are the subject of a police investigation". 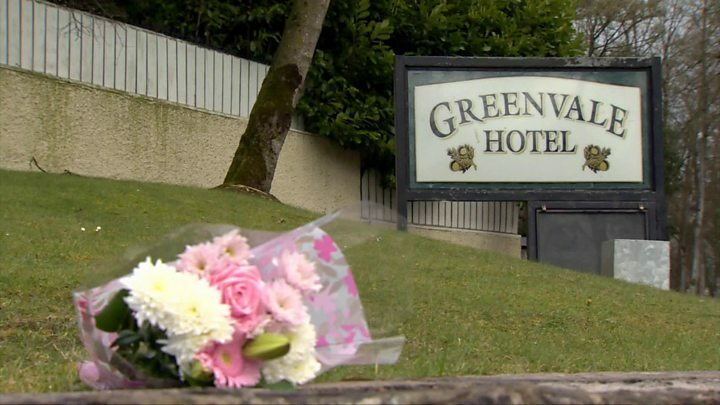 As she laid flowers at the hotel gates on Tuesday, Ms Johnston praised the actions of some of the young people at the scene who tried to help those who had fallen in the crush. "People just kept falling and falling," she recalled, explaining that some people fell over as they bent down to pick others up. The police said a large group of young people had been waiting to get into the disco at about 21:30 GMT. The security camera footage is being examined and police have appealed for videos captured by people at the disco. Officers have already spoken to a number of young people who were in the queue for the event; they plan to speak to others in the coming days. A number of parents had expressed concern that their under-age children were trying to enter the premises, added Mr Murray. He reassured them they were not the target of police inquiries. After discussions with the Director of the Public Prosecution Service, Stephen Herron, the PSNI had agreed "that is not an issue in this investigation", he said. "The focus of our investigation... is about trying to find answers for the families of the three teenagers who tragically died. "We need to know what you saw so the heartbroken families of Connor, Lauren and Morgan know what happened to their children." A memorial service for the victims was held earlier on Tuesday in Cookstown's Holy Trinity Church, where the principal of Holy Trinity College called on pupils not to bottle up their concerns. "Talk to the staff, talk to your parents, and let them know what is on your mind," said Isabel Russell. "Feelings will change over time, and how you are feeling today, tomorrow, next week, will change with time. 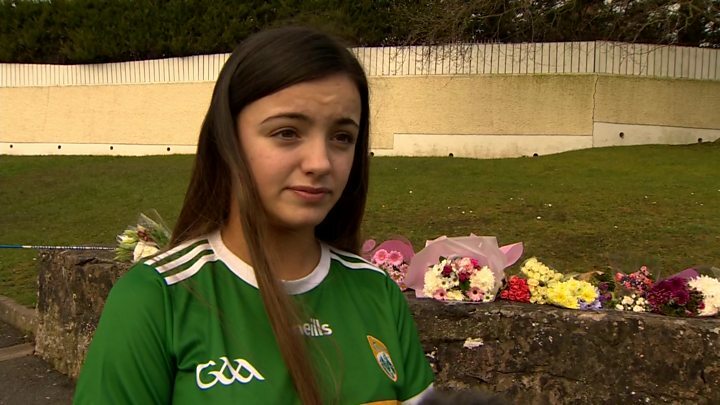 Catherine McHugh, principal at St Patrick's College in Dungannon, where Lauren was a pupil, described her as a "leader among her peers and a quiet, strong and loyal presence". "A treasured friend and capable young lady with a bright future," she added. A relative of Morgan's said he was "just a bundle of joy". Connor was described as "much loved and highly thought of", while Lauren was an "incredible friend". Her best friend, Cora McKay, said Lauren was "the most bubbly person you'd ever meet". "It was just such a unique smile and she was just an incredible friend." In a Facebook post, Edendork Gaelic Athletic Association football club said it was devastated by the death of "much loved and highly thought of" player and member Connor. "Connor will forever be remembered with the greatest affection by all associated with our club and indeed the wider Edendork community." A relative of Morgan's said he was "just a bundle of joy, always bouncing around, he seemed to have a lot of energy in him - a gentleman, he was." 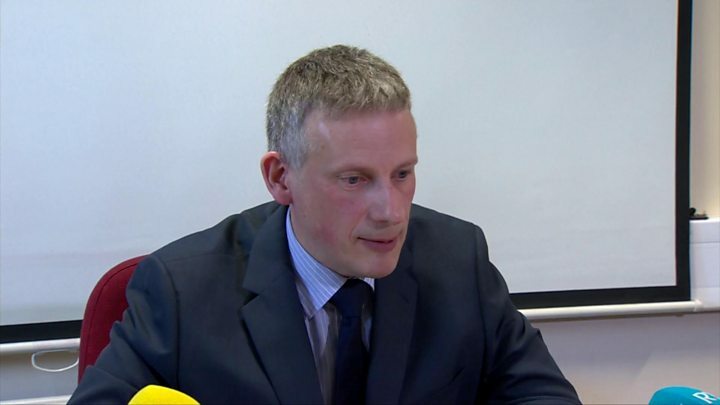 Fintan Donnelly, the principal of St Patrick's Academy in Dungannon, where the two boys were pupils, said the tragedy had "had a huge impact on the whole school community". Books of condolence have also been opened in Cookstown, Dungannon and Magherafelt. The Secretary of State for Northern Ireland, Karen Bradley, visited Cookstown on Tuesday to offer her condolences to all those affected by the tragedy. She met members of the emergency services and council representatives and thanked them for their efforts in the aftermath of the crush. Eyewitness Eimear Tallon recalled the horror in a Facebook post on Monday. "No matter how much we screamed and pushed back, there was no movement," she said. "Two of my friends fell to the ground. I tried to pull them up but at that point there was no room for them to even come back up. "With more and more pushing, I also fell. "But the thing about me was that I wasn't on the ground, I was on top of someone, and this person was on top of someone else." On Monday, prayer services were held at the two neighbouring schools and at the Edendork club. Fr Kevin Donaghy, parish priest of Dungannon, spent several hours with the pupils. He said several hundred had attended, many with their parents, despite it being a bank holiday in Northern Ireland. He recognised the concern within the wider community at what had happened. 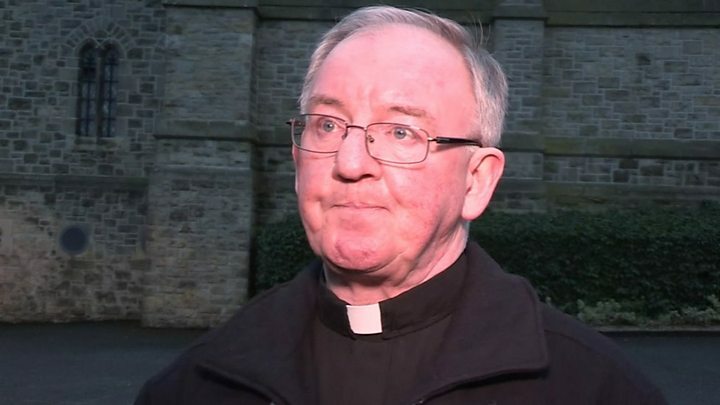 "That's certainly something that people do feel, you know: 'There but for the grace of God goes my child who was there,'" Fr Donaghy told BBC Radio Ulster's Good Morning Ulster. "There is a sense of that coming through, too, and, no doubt, many of the young people who came along to support each other maybe had been at the event as well."